Red snapper are one of the Gulf of Mexico’s signature fish, and are extremely popular among recreational fishermen, not to mention much sought-after in restaurants and seafood markets. Red snapper can grow to about 40 inches, weigh up to 50 pounds and live more than 50 years, says Ocean Conservancy, so it’s no surprise that these are fishing favorites. Red snapper season is popular among recreational and commercial fisherman alike, who wait eagerly each year for the start of the season – one of which has just begun. Deep sea fishing charter boats and commercial fishers alike are all loaded up with fishing gear for the 2016 recreational red snapper season in federal waters of the Gulf of Mexico began June 1. The season for federally permitted charter boats also began last week but runs for 45 days, ending at 12:01 a.m. July 17. Anglers are limited to two red snapper per person per day, with no fish measuring less than 16 inches. Federally managed waters are those farther than nine nautical miles from coast of all states that boarder the Gulf of Mexico. That said, this federal season is separate from the state season and does not impact international waters. Louisiana anglers can harvest red snapper in state waters with the same limits as those outlined for the federal season. The National Oceanic and Atmospheric Administration (NOAA) Fisheries announced a change in the allocation of red snapper stocks this year, according to an article from The Times-Picayune. Beginning this year, recreational anglers will get 51.5 percent of the year’s quota; traditionally, the commercial sector has been awarded 51 percent of the quota and the recreational sector – which includes deep sea fishing charters – received 49 percent. That means there’s even more opportunity to catch red snapper than ever before – a great time to get your hooks in the water in pursuit of these desirable fish! 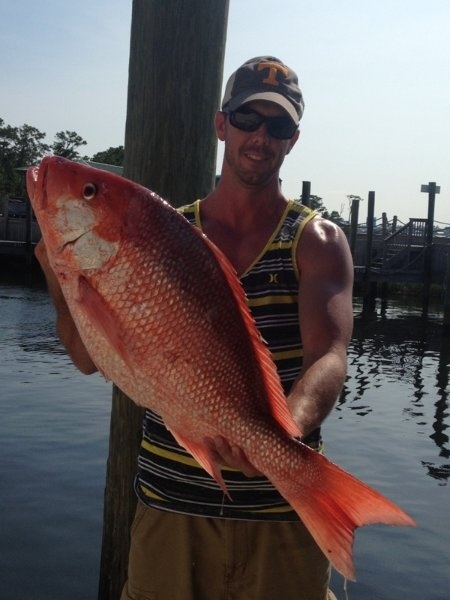 Make your way to the Gulf of Mexico to get your hands on some red snapper before the season ends! To book a charter with The Triple Trouble for great deep sea charter fishing in Orange Beach, Alabama, call us today at 256-431-5767.